1. Open Twine. You'll see a window named Untitled Story. It will contain a box titled Start. 2. Double-click on the box titled Start. Twine will open an editor window in front of the main window. 3. Leave the Title and Tags fields alone for now. Select the text in the body of the window by dragging your cursor across it. The text will be highlighted in blue. Hit Delete or Backspace on your keyboard to delete this text. You round the corner from the cafeteria to find Carson and Greta blocking your way to the bathroom. "What's the matter, little baby?" Carson sneers. "You gotta go potty?" Greta laughs nasally behind him. "Whaddya need a bathroom for? I thought you still wore diapers!" Carson steps forward. "Better run home for Mommy to change you, cause I'm gonna hit you so hard you pee your pants!" He takes another step toward you, balling his hand into a fist. 4. Close the editor window by clicking the red button in the window's top bar, or pressing Ctrl+W (Command+W on Mac). Notice that the contents of the box have changed to show the first few lines of your story. 5. Save your Twine story file by going to the File menu and choosing Save Story, or pressing Ctrl+S (Command+S on Mac). Name the file Bullied.tws (type this into the File Name field). Navigate to the place on your hard drive where you want to save your story (preferably in a new folder titled "BulliedStory"). If you don't know how to navigate your hard drive or create new folders, just click the Desktop icon for now. Save your story often! Losing an hour of writing when your system crashes is extremely frustrating! 6. Re-open the passage named Start by double-clicking it. Highlight the text of the first choice you want to give the readers by dragging your mouse over it. Make sure all of the text is selected, but no extra lines or spaces. For our example, the text would be Run away. 7. Now you are going to make the text into a link. Go to the Passages menu and select the first option, Create Link Named "Run away", or press Ctrl+L (Command+L on Mac). 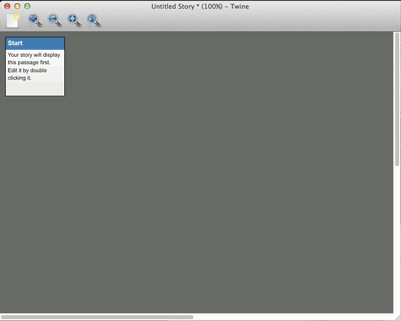 Instantly, Twine will make the text into a link by putting square brackets around it, create a new passage box named Run away in the main window, draw a link between the Start box and the Run away box, and open the editor window for Run away (probably directly on top of the editor window for Start). You'll be left looking at the editor window for Run away. If you are writing your own text, substitute the name of your own passage title for Run away in these instructions. The first passage of a story must always be named Start. 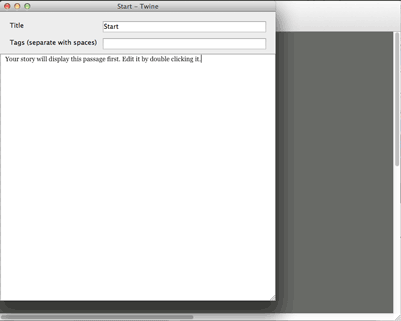 Without a passage named Start, Twine will not know which passage to show the reader first, and will give an error. 8. Close the editor window. In the main Twine window, you will see the box named Start has an orange exclamation point icon in the lower right. This means it contains a link that is not connected to anything. We'll fix that right away. 9. Create a new "page" in your main Twine window by going to the Story menu and selecting New Passage, or pressing Ctrl+N (Command+N on Mac). It will appear as a box named Untitled Passage 1 next to the first passage you wrote. 10. Edit Untitled Passage 1 by double-clicking its box. Twine will open an editor window in front of the main window. 11. In the Title field, select the text Untitled Passage 1 if it is not already highlighted, then delete it by pressing the Delete or Backspace key. Paste in the choice text you copied in Step 6 by pressing Ctrl+V (Command+V on Mac). You cannot use the Edit menu to paste text into the Title field. You take off down the hall. "Hey! Stop that idiot!" Greta yells. They charge. You dodge and duck around other students, but still hear their feet pounding behind you. There's a yelp as they knock someone over. If only you can make it to the next hall. You corner hard, then slow as you reach the administrative offices. Carson and Greta aren't dumb enough to hurt you here with all the teachers and staff around. But you still have to decide what you're going to do. You take a breath and walk into Mr. Witter's office. He looks up from his desk. "Oh, excellent," he exclaims, standing to greet you. "I'm always gratified when students take advantage of my open-door policy! Please, do sit." After a few false starts, you finally tell him how Carson and Greta have been cornering you and threatening to hurt you since the semester started. He listens, nodding, until you are finished. "Well, first of all, I want to assure you we take this kind of behavior very seriously here at Elmwood, and I can guarantee we will do everything we can to ensure these incidents are dealt with." He continues, but you aren't listening. Even if Carson and Greta didn't see you come in, they'll know who ratted on them. The school will make it more difficult for them, but they'll find ways to get even and be sure this is your worst semester yet. You shift in your chair, still needing the restroom, but not wanting to interrupt Mr. Witter. At least you did something, even if it will probably make things worse. You duck into a faculty bathroom. It's empty. You lock yourself in a stall, and sit on top of the tank, your feet on the seat. You wait. The door bangs open, and you hear footfalls echoing on the ceramic floor. They approach your stall. You hold your breath. The footsteps pass, and enter the stall next to you. One of the teachers. You hear their clothes rustle, then a sigh as they sit. You've got another 15 minutes until the first bell, when you can try to dart to Geography without Carson or Greta seeing you. You heard there was a new kid from out of town starting next week, maybe he'll provide a distraction for them, and they'll leave you alone more. You check your watch. Another 14 minutes left now. Another 14 minutes and five semesters left. You hold your ground, hands clenched. Carson hesitates. Apparently no one has stood up to him before. He looks back at Greta, and she rolls her eyes. "C'mon," she snorts, circling around you. "Let's see if this little baby cries." You realize you hadn't thought this far ahead. What now? "What's the matter, Carson?" you sneer. "Can't beat me up without your girlfriend to help?" His eyes flare. "Don't be stupid, moron!" he yells. "She's not my girlfriend!" He shoves you back toward Greta. But she just stands there, unmoving. You stagger sideways. "You jerk!" she shouts. She's yelling at Carson. She turns and stalks down the hall, her braids swinging wildly. Carson stares after her. Then he blinks, gives you another shove for good measure, and takes off in the same direction. You push open the door to the bathroom, shaking your head. If they're not talking to each other, they can't gang up on you. And Greta doesn't seem the forgiving type. You surprise Carson with a jab to the mouth that sends him back a few steps. You move quickly around him, but Greta is too fast. She grabs your shirt and yanks, sending you sprawling on your back. Before you can get your hands up, she stomps a sneaker down on your stomach. Carson joins in. All you can do is curl up and cover your face. A kick to the ear makes your head ring and your vision darken. Eventually he kicking stops, and you dimly hear Carson cursing at you. Something warm splats on your neck -- one of them has spitten on you. And then they're gone. You lost this fight, and probably the chance at future victories as well, but at least you didn't pee yourself. Write a story set on an island where the main character can walk along the coast in either direction and eventually return to the starting point. You should have a large loop of location-based passages that link both clockwise and counter-clockwise. Write a narrative that loops back on itself at least once, so that a later passage links back to an earlier passage. In a sci-fi or fantasy story, this could be the effect of a time machine or spell. Dreams, time warps, psychological disorders, or limbo are all possible explanations, as well.